While Linux has come a long way, especially with the community support of Ubuntu, many tasks are still done by editing text files. These files are very sensitive to grammatical errors, requiring us to enter the data in perfectly for them to work. The Linux community, especially the Ubuntu community has tried to make editing these files much easier by releasing a number of programs which do the editing for us. All we need to do is put the settings we want into a graphical interface. 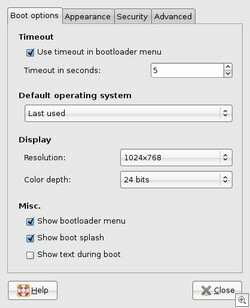 GRUB, the standard boot loader for Ubuntu can be changed by editing a text file, which if edited incorrectly will cause Ubuntu & Windows to fail their boot up. Download Startup manager and change the settings in it to suit your needs, all through an easy to use interface. 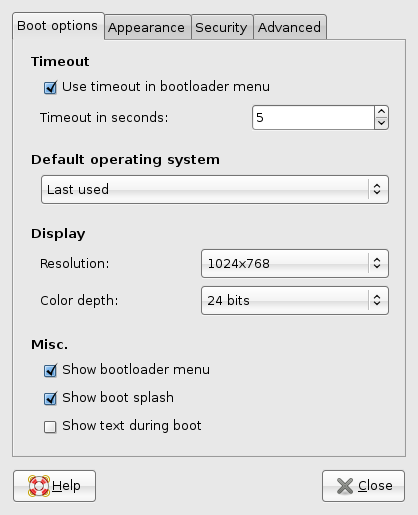 One nice feature is the “Last used” option which will reboot the last operating system you had open, allowing for automatic updates and the like to do their thing. Download it from the authors website. You will also find detailed installation instructions on the site. I really appreciate this application as I know the pain I have been through in past years, editing the file manually. For added security, this program also lets you create a rescue floppy, which will save you all sorts of problems if things were to go wrong.